Rethink the simple tools that have shaped our world. 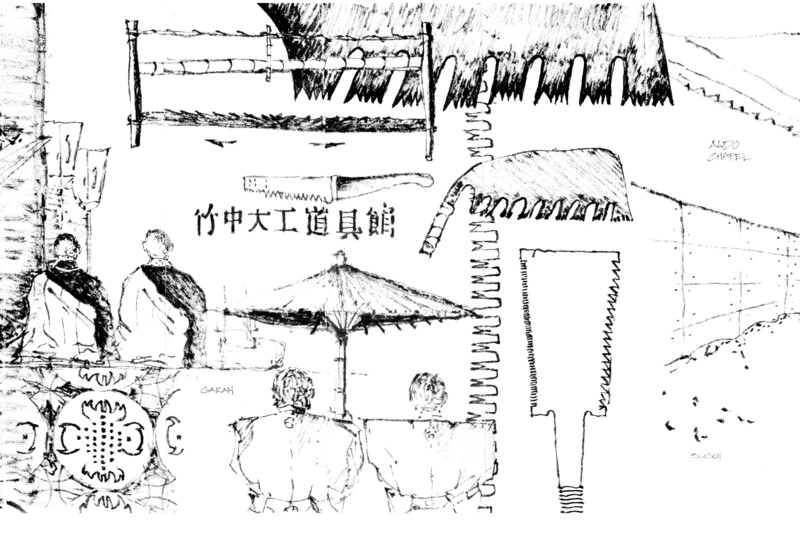 The saws in this sketchbook, with teeth directed toward the handle, are typical of Japanese hand tools. The direction allows the user to pull the cut rather than push the cut. Western saws are the opposite in that the cutting takes place on the push action. One saw in particular has two different sized and shaped teeth flanking the tool. The difference is that the tight or smaller teeth are for the crosscut versus the larger ones that are used for the rip-cut running parallel to the wood grain. The saw design seems a small reflection of the Japanese attention to detail and respect for not only materials like wood but also for the process involved with the art of its manipulation. Since Japan is an island, and islands by their nature have finite resources, this respect for the wood is also about maximizing available resources with the least possible waste. Reduced waste is at the heart of sustainable design. Rethinking a tool such as a saw is a springboard for rethinking the much larger outcome of the tools that we often take for granted. Author and illustrator: Charlie Szoradi is an architect, inventor, and the CEO of Independence LED Lighting. He writes about many other topics related to rethinking tools like a Japanese hand saw through his extensive travels around the world. If you have found this posting online, it is an excerpt from Mr. Szoradi’s book Learn from Looking that served as the inspiring seed content for this drawing share resource. For additional drawings and insights on Japanese hand saw and other types of tools, we hope that you enjoy exploring LearnfromLooking.com. You can search via general terms such as sustainability as well as narrower terms such as Japanese hand saw.